Q. 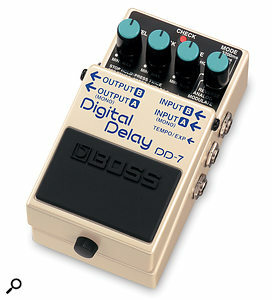 Do I need to use a DI box with a guitar pedal? I've been wondering whether sticking a guitar or bass into an effects pedal, preamp or amp modelling pedal to go into a PC would mean you wouldn't need a DI box in the chain. Or would a quality DI box going into the pedal improve the sound? If you tend to send your guitar signal through a standard guitar effects pedal such as this Boss model while recording, there's no need for a DI box between the source and your recording system. SOS Technical Editor Hugh Robjohns replies: Unless an electric guitar or bass is fitted with active pickups, it needs to be connected to a device with an input impedance of around 1MΩ or above, to avoid loading the pickups and compromising the tone. Guitar amplifiers are designed to accommodate guitar pickups, as are the majority of active DI boxes with line inputs. Many audio interfaces also offer a high‑impedance instrument input, in which case you can just plug straight in. Virtually all effects pedals are designed to accept the output from passive or active guitars and basses, and as such are designed to present a high input impedance, in exactly the same away as a guitar amplifier does. The difference is that the effects pedal will output an instrument‑level output rather than the mic‑level output provided by a DI box, so should be fed into a mixer or interface line input. Most computer interfaces and mixers have enough gain to cope with instrument‑level signals (nominally about 10‑20dB below full line level) without any problems. The only benefit you lose when using a pedal rather than a DI box is the ability to drive very long, balanced cable runs, but in a typical project studio that is seldom a problem. SOS Editor In Chief Paul White adds: It's important to note that pedals that incorporate an electronic bypass, as opposed to a 'hard‑wired' bypass, will usually work as DI devices even when in bypass mode, as the high‑impedance buffer circuitry is still active. The way to check is to take out the battery, put the unit in bypass and then see if you get any signal through it. If you do, it is designed with a hard‑wired bypass. If not, it is electronic.